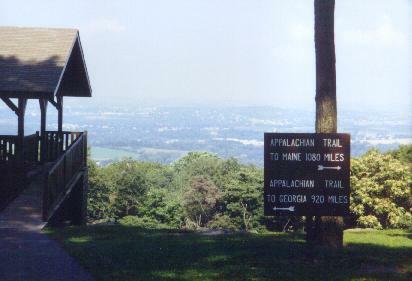 When the Eastern Pennsylvania QRP Club (EPA-QRP) first instituted the Appalachian Trail Awards Program, I started looking for an interesting place from which to activate the Trail. After combing through a Trail guide I had picked up, Pen Mar, Maryland, appeared to be a very interesting spot. 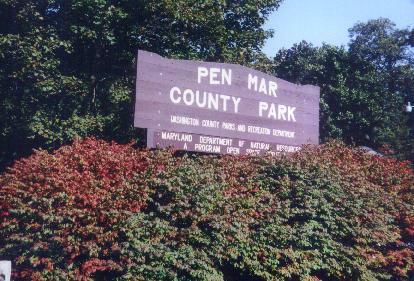 Pen Mar, as the name suggests, is right on the Pennsylvania/Maryland border. If I could find a suitable location, I figured I could operate from both states simultaneously. So, hams going for the Appalachian Trail awards could pick off two states with one QSO. It took me until September of 2000 until I finally managed to make the trip. From the research I had done, I learned that the Trail runs through Pen Mar County Park. Pen Mar County Park has quite a history itself. Many years ago it was an amusement park and folks from Baltimore and Washington, DC, used to travel there by train to escape the heat of the city. According to my guidebook, the Mason-Dixon Line would be somewhere just outside the Park to the north. A week earlier, I loaded up the Truck and headed out for Pen Mar. Before I even got out of town, I heard weather forecasts calling for thunderstorms and heavy downpours. I decided to postpone my trip for a week. It was a good move on my part for two reasons. First, we did get a lot of rain that day. 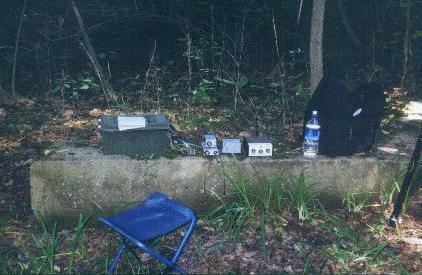 Second, Ken, N2CQ, would be operating from the Trail in Virginia the following week. So, I would have a shot at picking up a Trail-to-Trail QSO. The following week I set out again. For a while there, I didn't think I was going to make it. First, I got off to a late start. It turns out that I had underestimated how long the trip from Phoenixville, PA to Pen Mar, MD would take. Turns out, it was about an hour longer than the two hour trip I had figured on. Then there was the fog on the Pennsylvania Turnpike so thick you could cut it with a knife. Next, I decided to take an impromptu "short cut." This slick move, took me right through the heart of downtown Gettysburg and acutally cost me time on the trip. Next, I missed a turn off (twice!) onto Pen Mar Road which again put me in the traveler's penalty box. I originally planned to be on the air by 10:00 AM. It was almost 10:30 AM when I finally pulled into the parking lot at Pen Mar County Park in Pen Mar, Maryland. I quickly grabbed my gear and headed into the park. What a view from the Applachian Trail signpost in the Park! It's a beautiful vista overlooking the Cumberland Valley. I paused for a minute to take a picture and take in the view and then proceeded down the trail. The guidebook I was using had a pretty detailed description of this part of the trail, however, it was slightly outdated. When I exited the Park, the guidebook's description just didn't seem right. I proceeded to walk along some railroad tracks to take a look around when I heard someone shouting to me. A man and woman from one of the nearby houses asked me if I was looking for the Trail. I said I was and that, specifically, I was looking for the Mason-Dixon Line marker. He said there was a marker up in a wooded area behind his house. Of course, that wasn't the one on the Appalachian Trail. When I made that distinction clear, they put me back on course. It seems that the Trail was re-routed in this area at some point in time. They said they often see hikers looking confused when they come out of the Park. I guess there are a lot of outdated guidebooks out there. Where I had originally exited the Park, I was so close, I can't believe I missed it! When the Trail comes out of the Park, it makes a sharp left and proceeds across some railroad tracks. Then it enters a small but heavily wooded area. 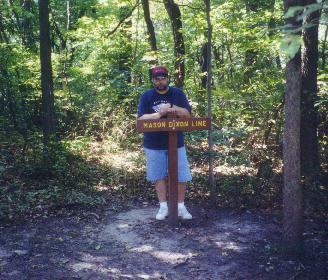 The Mason-Dixon Line marker is located just off the Trail in the middle of this wooded area. I guess I wasn't paying attention and missed the trail blazes which indicated a turn coming up. Just goes to show you -- pay close attention to the trail blazes. I finally reached the Mason-Dixon Line Marker around 11:00 AM. There was a perfectly-positioned tree which allowed me to center my inverted vee right on the border. So, one leg of my doublet was in Franklin County, Pennsylvania, and the other was in Washington County, Maryland. Just across the trail from the marker was the remains of the foundation from an old building. It made a convenient table for the radio equipment. I fired up my little SW-40, tweaked the antenna tuner, and called CQ. I was met with a nice little pile-up. 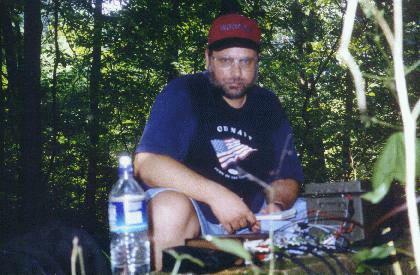 The first callsign I was able to pick out was N2CQ who was operating from the Trail in Virginia. Over the next 3 hours, I worked 16 stations. This includes a second QSO with Larry, WD3P. Larry called me a second time so he could work Franklin County, Pennsylvania, at 500mW. As I was working Larry, a train went by about 20 yards from where I was located. It made it tough to hear Larry's QRPp signal but we made it. Throughout the afternoon, I was amazed at some of the signal reports I was getting on my little 1 watt signal. My 40 meter doublet, fed with 300-ohm TV twinlead, was only up about 18 feet at the most. During the last couple of QSOs, the QRN was getting pretty bad. Around 2:30 PM, I decided to pack up my gear and make the long trek home. As I was taking down my antenna, I could hear the sounds of Big Band music off in the distance. When I walked back up into the Park, I was amazed to see hundreds of people there for an outdoor concert. Especially since the Park seemed deserted when I first got there. In contrast to the trip down there, the trip home was uneventful. It was a fun day out on the Trail. Pen Mar, MD, is a great place to work the Trail if you aren't able to do any serious hiking. Even if you don't want to walk down to the Mason-Dixon Line, Pen Mar County Park itself would be a great place to set up and operate (except on Sunday afternoons if there is a concert scheduled). 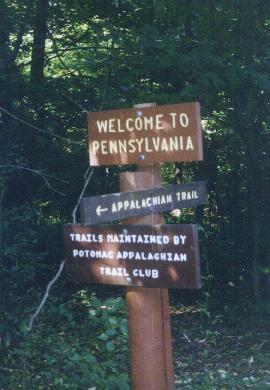 For more information on the Appalachian Trail Awards Program, visit the EPA-QRP Club's web page.